Select a product from the dropdown menu to learn more about our games. 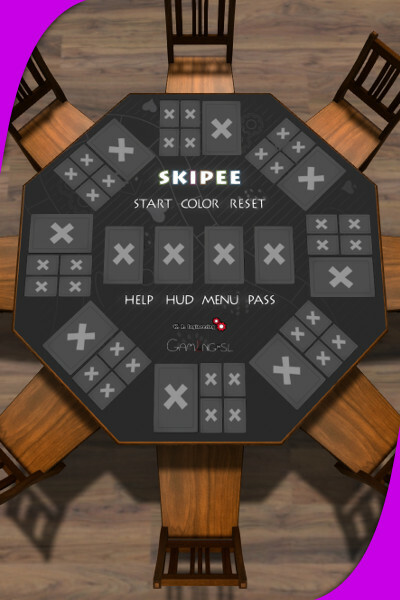 The goal of Skipee is to play all of the cards in your personal stock pile by building stacks of cards from 1 to 12. The first player (or team) to empty their stock piles wins the round. The faster you empty your stock piles, the more points you get! First player or team to cross 500 points wins the game. Number of points players must achieve to win the game. Playing with an extra deck of cards or not. Gaming.SL LIVE (Gaming in SL LIVE) is a product of K.R. Engineering in Second Life.